The Australia Day launch of the Southern Hemisphere Space Studies Program high altitude balloon payload under an AREG / Project Horus balloon was a great success! Launched from the Mt Barker High School, in the Adelaide Hills, it was an almost “text book” launch. The AREG launch team were on site early in the morning to prepare for the event. Matt VK5ZM made sure very knot was tied correctly while Mark VK5QI, Scott VK5TST and Ben VK5BB prepared the AREG payloads. Andrew VK5AKH and Gary VK5FGRY helped set up the event “environs” with the marquee and bollards/bunting to guide the crowd that was expected. Grant VK5GR meanwhile recorded the event (and will be making a short launch video soon). The flight used a 1600g latex balloon and was “powered” by Helium. Two AREG payloads flew, being the primary RTTY telemetry on the 434MHz band and the telecommand LoRa package used to control early flight termination if the need arose. The AREG crew were joined by the SHSSP participants and event organisers from the University of South Australia and International Space University a little later in the morning. Balloon filling operations were supervised by Mark VK5QI who enlisted the help of several of the ISU students to control the balloon as it went through flight preparations. The ISU payload included multiple sensors and a telemetry transmitter of it’s own. There were three cameras onboard, a video camera looking down and an IR camera looking down and a stills camera looking out. The payload telemetry consisted of a 9600bps VHF data feed that the Uni was testing on the 2m amateur band (for a future Cubesat mission). The controller for their payload was based on a Raspberry Pi. The end result was impressive considering the students had little more than a week from concept to realisation! The launch was attended by visiting dignitaries from the Mt Barker Council including Mayor Ann Ferguson, various media reporters from several TV and radio networks and by more than 150 members of the public. It was presided over by John Connolly from NASA who is their ISU representative, as well as Associate Professor David Bruce from the University of South Australia. The launch itself went faultlessly, with the surface winds dropping off at the last second to make it an easy gentle vertical ascent. 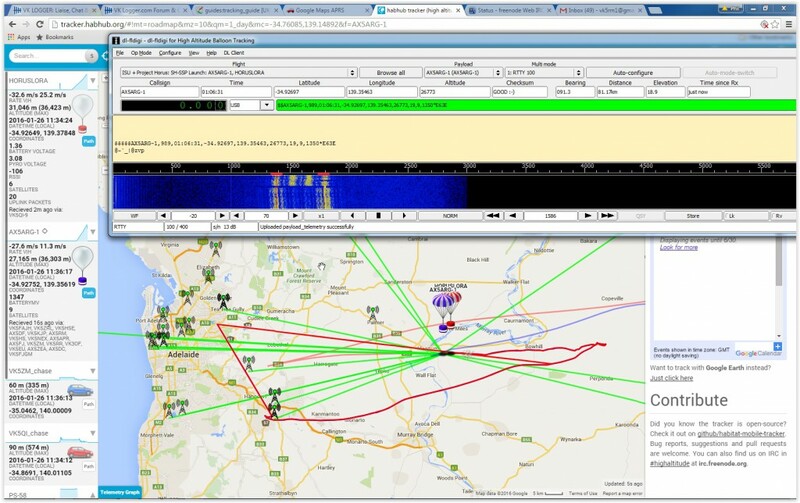 A major contribution to the success of the flight was the reception and relaying of tracking data from a large network of amateur radio stations across South Eastern Australia. 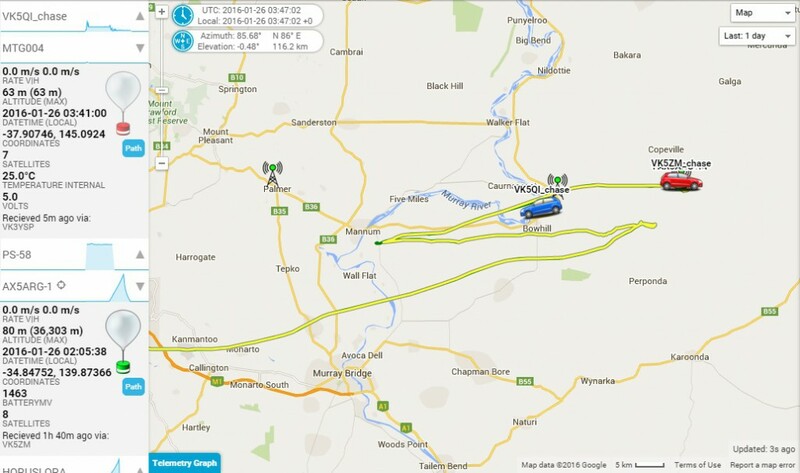 To enhance the sense of involvement by the amateur radio community, the AREG operated the main telemetry beacon under the special amateur radio callsign of AX5ARG-1, to mark the occasion of the launch taking place on Australia Day. This captured the imagination of many first time tracking stations. It was great to see over 35 stations, including many first time contributors adding to the successful collection of flight telemetry. AREG will be offering a special commemorative QSL card to mark this flight to all stations who can show they receive the telemetry. If you managed to upload data to HabHub.org then you automatically qualify. However, if you copied telemetry but didn’t manage to get it into the HabHub system, please send an email with a screen shot or captured telemetry frame to vk5gr@wia.org.au for inclusion in the SWL QSL card logs. AREG member Peter, VK5KX also made a major contribution establishing a remote telemetry command post high atop of the eastern rim of the Mt Lofty ranges. From there he was able to not only collect telemetry but also help the ground chase crews with liaison communications. Thanks Peter for your important contribution. 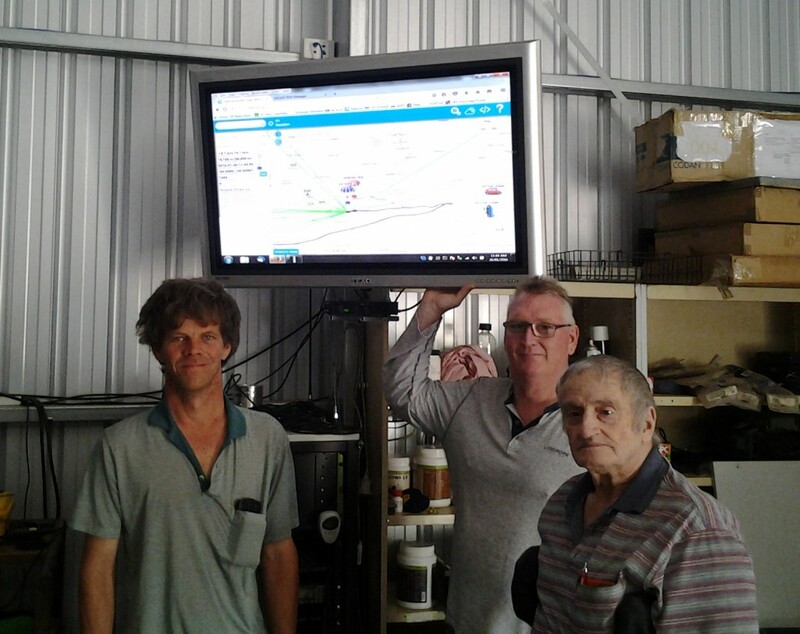 AREG’s good friends out at the Riverland Radio Club also made an impact not only with tracking but through publicity on ABC Riverland radio as well! Thanks Ivan VK5HS and the team! Finally, probably the most significant task considering all that had gone before, was to recover the payloads once they landed. Three tracking teams were out in the field lead by Matt VK5ZM/Grant VK5GR in car 1, Mark VK5QI/Gary VK5FGRY/David VK5DGR in car 2 and a team from ISU in car 3. The chase was one where best laid plans changed at the last minute. By quirk of fate, the VK5ZM team didn’t actually obtain the wind predictions used to drive the tracking system until after the 1800Z Global Forecast System model was released, which gave us a surprise. Overnight, the jet stream had intensified, which resulted in the balloon traveling ~25km further down-range than planned. This changed our chase route quite substantially at the last minute and instead of targeting Bow Hill, the VK5ZM team headed for Karoonda. Meanwhile the VK5QI team which had departed earlier was already heading for Bow Hill. In the end, the two AREG recovery vehicle teams rejoined each other out on the road and were on site before the balloon landed. However, due to local terrain and access restrictions, we did not catch sight of the parachute landing this time. The recovery teams had 3km of rough 4WD tracks and paddocks to negotiate and a further 2 km round trip hike through the thick Mallee using classic radio direction-finding techniques to navigate to the payload and then back to their vehicles. The SHSSP and AREG teams were ecstatic over the success of the event and there was also very good media coverage. Stories were aired on ABC891 radio in Adelaide and on ABC Riverland (thanks to the Riverland Radio Club who were following the event) as well as on NWS9-TV Adelaide and the ABC-TV South Australia news. The SHSSP event organisers were thank-full to the AREG for their contribution to the success of their stratospheric balloon launch project. Many thanks must also go to all amateur radio operators who tracked and uploaded the telemetry data as well as to the UK High Altitude Society who built, maintain and provide access to the habhub.org system for tracking balloon flights!